So you've installed RescueTime. You've gotten a few weeks of data, and maybe you've learned some things that you'd like to change. In a lot of cases, just being aware of your measurements can be a pretty big motivator. Other times, however, you might need something a little more active. RescueTime has two ways to keep on top of specific measurements you're trying to make a dent. 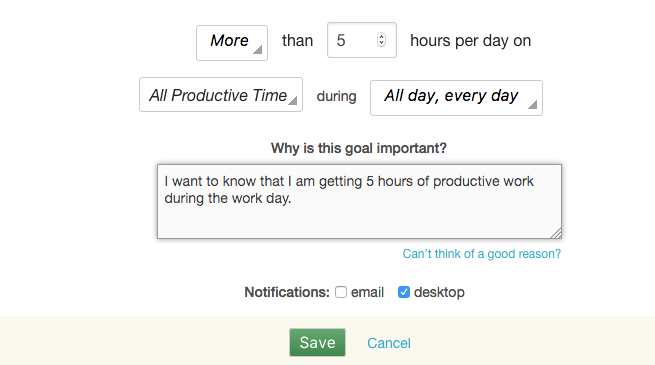 The first is setting a goal, and the second is giving yourself little nudges with our alerts feature. Once you set up a goal, it will be tracked on your dashboard and shown to you in your weekly email. It is a great way to keep a close eye on a specific metric and track your progress. If you want to get a bit more active about making changes, you can set up a daily alert. Alerts are very similar to Goals, but when you reach the time you've set up, you are given an alert on your desktop or emailed to you. It's a great way to train yourself. For example, the team here at RescueTime all have an alert that goes off when we've reached 5 hours of productive work per day.